YOKOSUKA, KANAGAWA PREF. - A rare giant squid was caught in Tokyo Bay after a number of the species were spotted earlier this year along the coast of the Sea of Japan, officials from a local aquarium said. 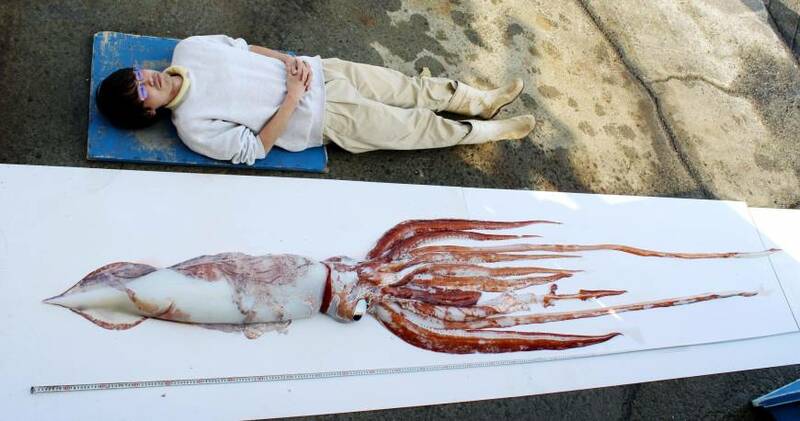 It is unusual for giant squid to be found along the Pacific coast and in Tokyo Bay. 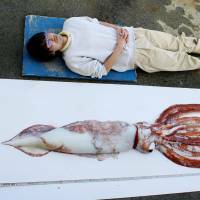 The squid, classified as Architeuthis, measured about 3.6 meters long and weighed about 24 kg. The giant squid is the largest invertebrate animal and typically lives in the deep sea. A 6-meter-long giant squid was found in Tokyo Bay off Miura, Kanagawa Prefecture, in May 1968, and this year giant squids have been caught in various locations around Japan, including Toyama, Niigata and Tottori prefectures. According to Miura’s Keikyu Aburatsubo Marine Park Aquarium, which examined the giant squid, a local fisherman found the squid floating off Yokosuka, Kanagawa Prefecture, and captured it alive on March 12. The aquarium is expected to display the giant squid specimen, which died several hours after being caught. Aquarium officials said the squid, whose two longest tentacles remained intact, will provide valuable data for the fishing industry.